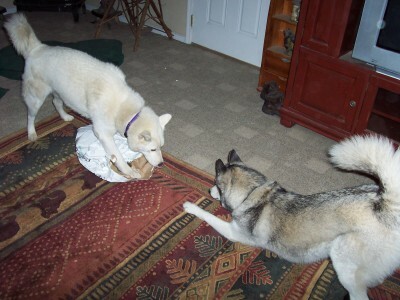 Ah, the joys of being a puppy (a male Siberian before 2 years old is just a 55 pound puppy). I was feeding the dogs and picking up bowls. Queen Natasha the Evil, despite being fed first, is the slowest of the eaters, and, thus, has her bowl picked up last. 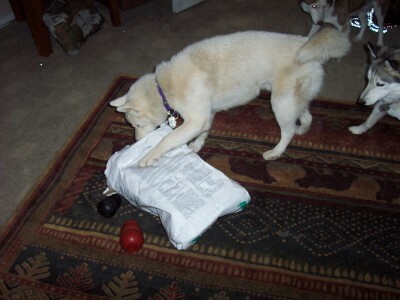 That gave Qannik time to win the grand prize – a freshly opened – but empty – bag of dog food. 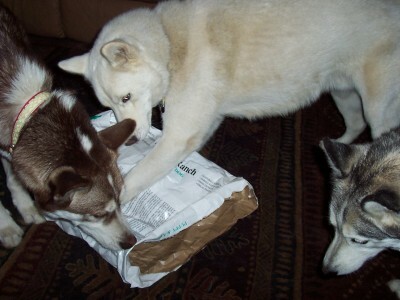 So, by the time Natasha had found him, he was already deep into the enjoyment of the food. 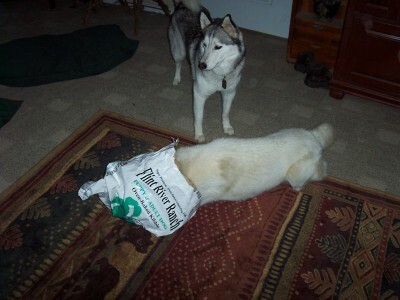 And, so, the Queen had to growl at him to try to get him to drop the bag. 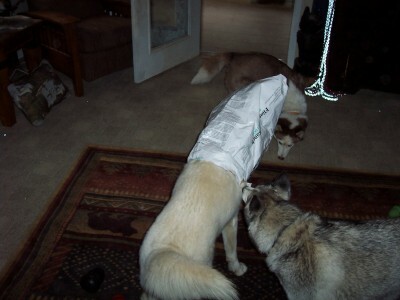 But Qannik is an insolent pup and runs off into the den with the bag. The Queen, dumbfounded, looks at me for help. 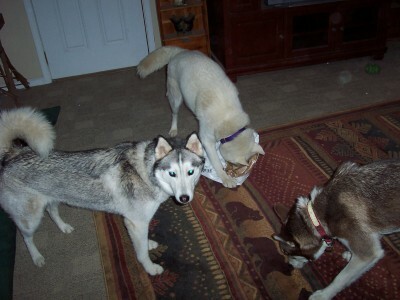 And Kodiak decides to join the fun. Realizing that I have no plan of giving her the bag, Natasha decides the next attempt is to turn it into a game – Play Bow time ! ! ! But Qannik has seen this all before and refuses to play. He keeps the bag to himself. And dives deep into it to keep the others from having it. 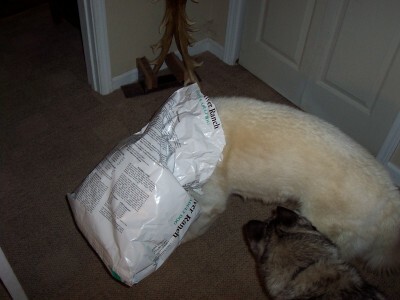 Which leads to its own problem – a stuck dog. Isn’t it great that the more stuck Qannik comes, the more “helpful” Natasha becomes. 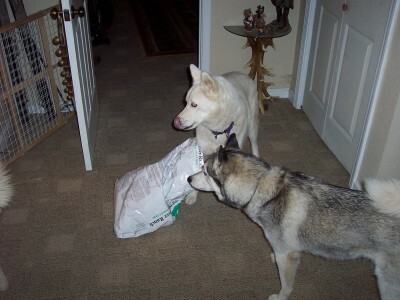 But the story has a happy ending, after battling the viscious attack dog food bag, Qannik sucessfully defended our home and wrestled it to the ground. As his reward, he has now being licked by all of the Thundering Herd. 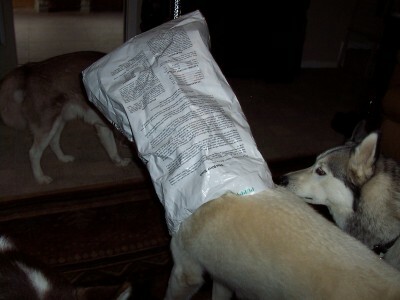 A regular reader of the website told me one time that she had a friend whose puppy suffocated inside of a dog food bag. I was so horrified that I almost removed this story from the website. 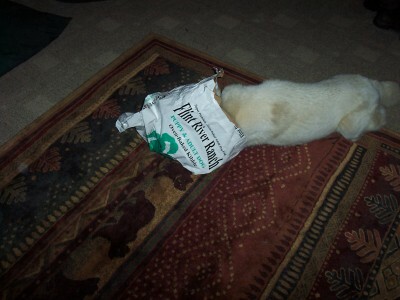 Instead, I thought I would take the opportunity to warn you – never leave your dog unsupervised with a bag of dog food. I certainly do not. Good point. Best to be careful, Sibes can be so mischievous.